Do you ever have one of those days where you feel a bit tired and sluggish, and like you probably need to pump your body full of good things? Well, this is the most delicious remedy! It’s full of beans, grains and vegetables (and topped with a healthy portion of dairy too – optional of course!). I didn’t fancy making this dish today. I had a lovely griddled pork chop dish planned, but on getting home from work realised my pork chops were a bit old! However, once I threw this together I was glad I did. It’s full of deep, earthy Mexican flavours and really is the most simple way of injecting good stuff into your diet. This will serve 3-4 (just increase the amount of beans and chopped tomatoes if you want to serve more) and takes 30 minutes to make. 1. Chop the onion and garlic and put in a large saucepan with the olive oil. Sizzle for 2 minutes, then add the paprika, cumin, ground coriander and cinnamon. Stir well, then tip in the red wine. Allow to bubble down. 2. Add the black beand and black eyed beans (with a little of the water from the tins) and chopped tomatoes. Simmer for 2-3 minutes. 3. Add the chopped yellow peppers and quinoa. Add a little water if it’s too thick, and bring to the boil. Let it simmer gently for approximately 10 minutes until the quinoa is cooked. 4. Turn off the heat and stir through the chopped coriander. 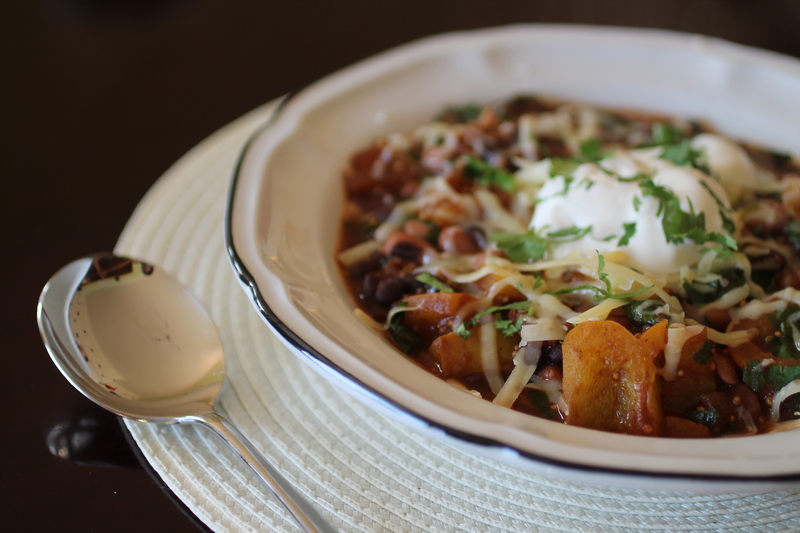 To serve, top each bowl with a little grated cheese and a dollop of soured cream. Enjoy the health kick! Yum! 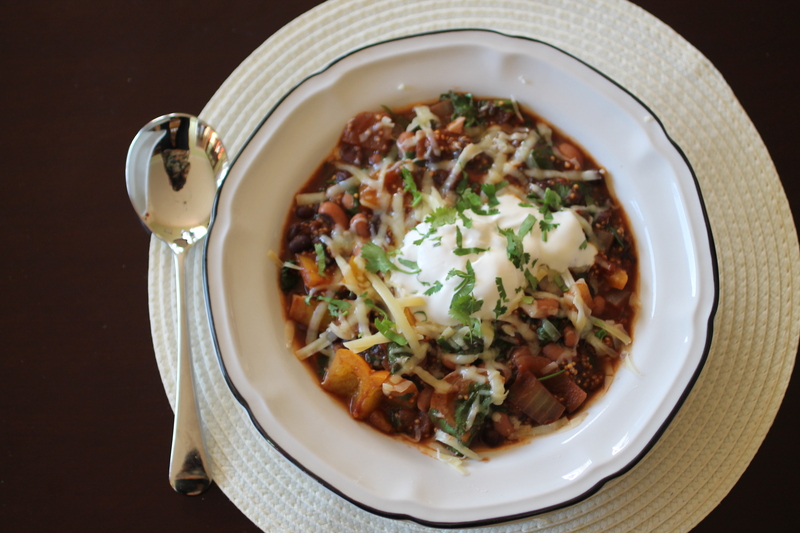 Beans are one of the best things you can eat and I live off soups and stews like this one. I’ve never thought about adding quinoa to a dish like this though. Yum, yum, YUM! Thank you so much for sharing! This is definitely going on next week’s meal plan! I recently made a Spring Barley Salad with mushrooms and asparagus! This looks so good!!! Plus all of the ingredients are so accessible and affordable. Thanks for sharing – will definitely try this one! This looks great. I will definitely have to try it. Now see – this is a perfect example for those who are deathly afraid of cooking, that it can be easy and creative. YOu’ve made a healthy, hearty, and delicious soup!! !